Over the weekend, Solar Impulse finally departed from China to begin its five-day, five-night solar-powered journey across the Pacific Ocean on its way to Hawaii. This leg of the round-the-world expedition had been delayed for weeks due to bad weather, and a storm approaching Hawaii is forcing pilot André Borschberg to make an unscheduled stop in Nagoya, Japan. The above video is the recorded live feed from Si2 this morning. Around 0:30 begins the footage of the ground crew’s conversations about the weather conditions necessitating the unscheduled stop. Si2 lands in Japan this morning at approximately 10am ET. The change in route became necessary when a wall of storms over the Pacific Ocean shifted course slightly. 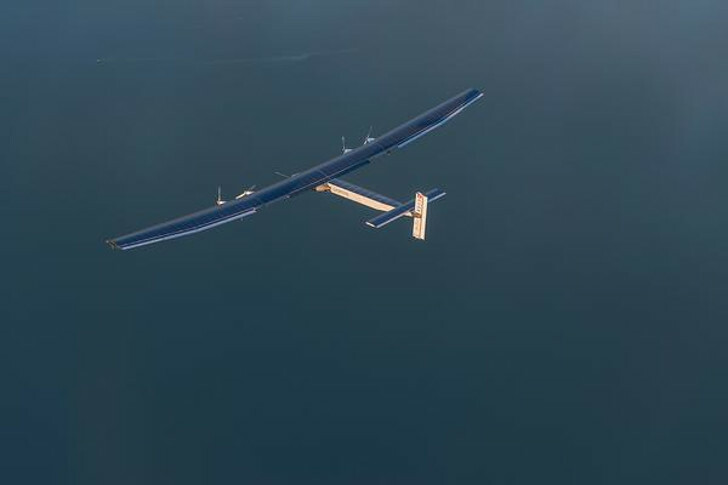 Si2 meteorologists made the call early Monday morning when it became apparent that the storm posed too much danger for Borschberg and his ultra-light airplane. Essentially, stormy weather would make it impossible for the aircraft to gather enough sunlight to charge the batteries to power the plane through the night. Si2 must fly in sunny skies, so the crew keeps a close eye on weather reports to determine safe flight paths. The experimental single-man aircraft departed early Sunday morning from Nanjing, China, and will land ironically in one of its sister cities Nagoya, Japan. At this time, the ground crew is moving quickly to prepare for the plane’s arrival, and they do not know how long the flight will be grounded.